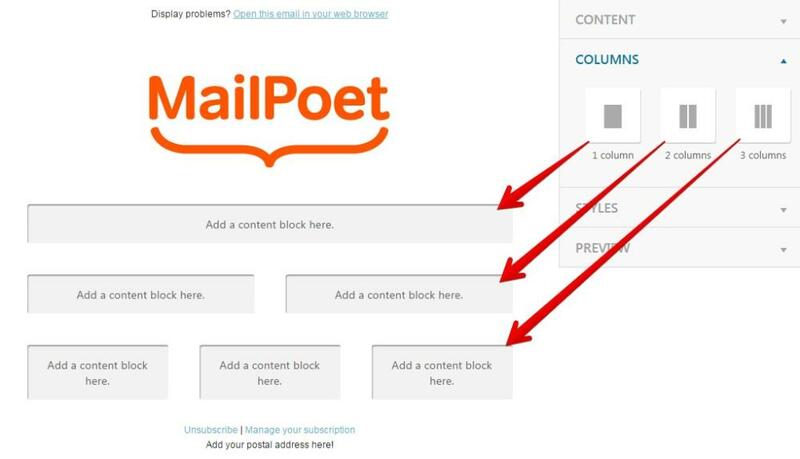 The newsletter designer is the most important part of MailPoet. You'll probably spend most of your time using it. 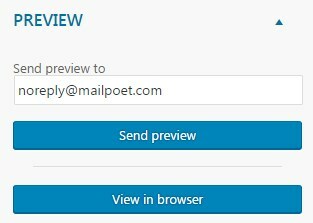 Luckily for you, we've completely redesigned the designer from scratch for MailPoet 3. 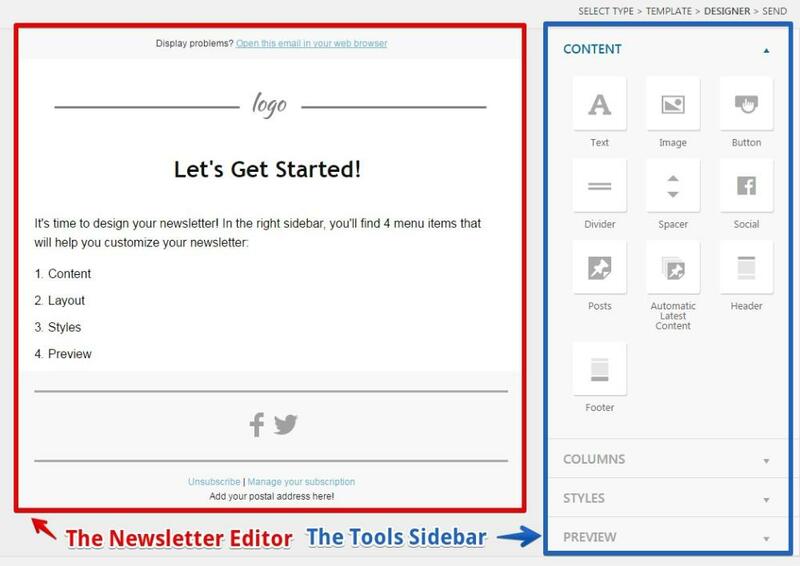 In this article, we'll examine the two main parts of the designer: The Tools Sidebar and The Newsletter Editor. Content: Here, you can add buttons, widgets, and other content to your newsletter. Columns: On this panel, you can add pre-created columns to your newsletter. Styles: A place to change your global newsletter styles. Preview: Here, you can view a preview of your newsletter. All of these tools are drag-and-drop. That means you simply have to grab one and drag into a layout block in the editor to the left. This tool lets you add images to your newsletter. Pretty easy, eh? 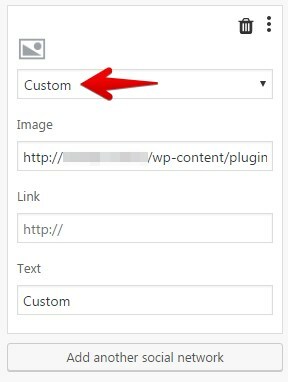 You can choose from images already uploaded to your WordPress site as well as directly upload new ones. This tool is used to create buttons. When you drag the button tool into your newsletter, you'll need to click on the small gear icon to edit its settings. This icon is displayed when you hover your mouse over the button block. Most of the other tools contain an options panel similar to the one above. The spacer works just like the divider. The only difference is the lack of a visible image (there is no visible divider bar.) It is useful for adding empty spaces or margins between your newsletter content. Simply select the Posts that you want to insert and click the Insert selected button. Don't forget to check all the existing Display options to modify how your posts are displayed. This tool is nearly identical to the Post tool above. 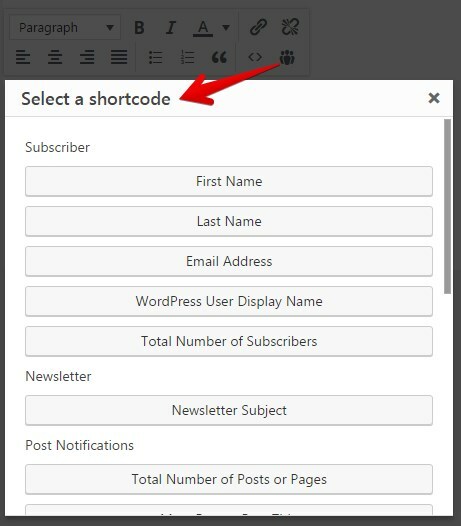 The primary difference is that this tool will automatically include your latest Posts in the newsletter without having to manually add them each time you want to send a new newsletter. This tool is very useful when creating a Post Notification campaign. Like the header tool, the footer tool automatically adds the Unsubscribe and Manage Subscription links to your newsletter. These links are mandatory - you must include them in your newsletter. Once you have dragged them to the editor, simply drag your other items into each content block. 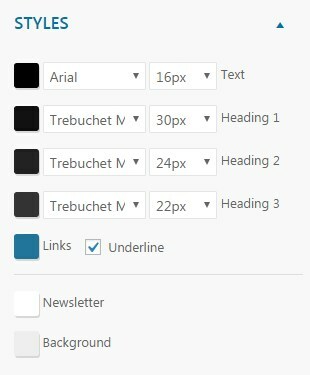 You can also change the text color of the newsletter body, as well as the background color of the email itself. Perform three actions (Edit Settings, Delete or Move) on each object (a text block, image, divider, spacer, Post, button, etc.) or layout (one, two or three columns) that this object is inside. In the image below, you will see two sets of three small grayish icons. 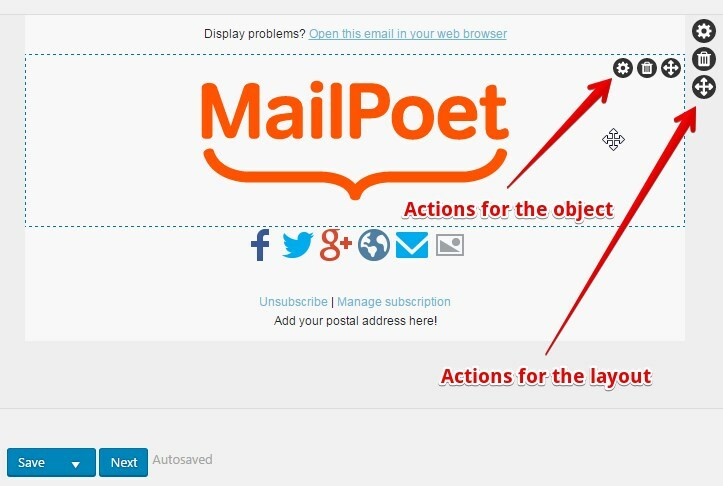 The first item controls the actions for the image (in our example, the MailPoet logo image) and the other are actions relative to the one column layout block.